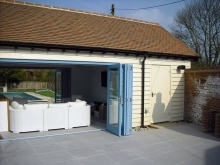 An existing external swimming pool was separated from the main house and garden by a single storey building which was starting to collapse and did not provide useful accommodation. 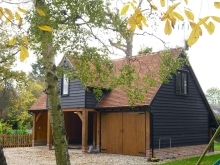 The brief was to replace this structure with a pool building that would link the pool back to the main house and garden as well as provide some ancillary accommodation when the pool was in use. The new pool building was designed as a simple structure set between the pool and main garden but with large sliding folding doors on both sides to allow the building to open up to both the pool and a large paved area on the south western side. The scheme is tied together with a sinuous brick garden wall that runs along the south eastern side enclosing the paved area which includes an outside fireplace and barbeque area. A small kitchen is provided in the main space with the remainder of this area given over to sofas between the two sets of sliding folding doors. 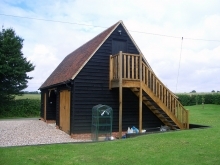 A shower room for the pool is provided together with a studio/occasional bedroom which is positioned to take advantage of the great views out over the adjacent field. Tucked between the habitable areas and the sinuous wall is the pool plant room with a curved glazed gable sitting above the wall and high level internal glazing to the living space. The building has transformed the use of the pool and provides a fun and relaxing set of spaces for entertaining with family and friends, especially during the summer months.